Our software series O&PfC® (Oliver&Pharr for Coatings) is an extracted program module from our premium suite FilmDoctor® Studio which enables you to mechanically characterize complex surfaces properly by fully automatic analysis of indentation measurements. Such a mechanical characterization requires calculation of generic material properties including the real Young's modulus of each layer, the yield strength of each layer, and the Poisson's ratio of each layer, which only O&PfC® can evaluate for almost arbitrary structured materials. Particularly, its simple handling allows you to gain more information out of remaining or performed measurements within a few minutes only. Due to the automation of the procedure, you get not only the requested Young's modulus in the twinkling of an eye, but also the complete evaluation (28 field variables likes von-Mises-stress, normal stresses etc.) of the elastic stress-strain field inside the sample. The features covered below are features of the model on which this product series is based. Therefore, they may differ from the capabilities of the individual editions as they are not all completely implemented in all editions. * Practically it depends on capabilities (e.g. the resolution and noise floor) of your measurement instrument. Only these generic physical material properties can be reused in nearly any other surface structure (e.g. 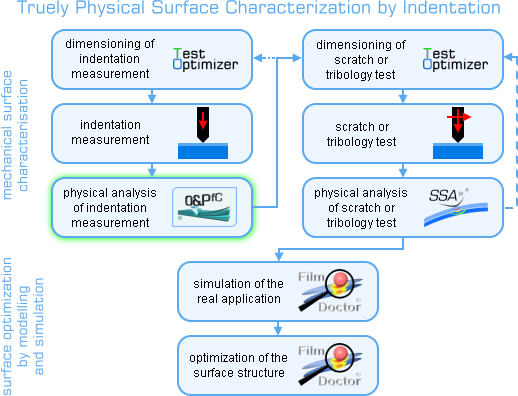 for surface optimization by means of modeling and simulation or for analysis of complex contact measurements like scratch tests) without being obliged to repeat the characterization. The O&PfC allows one to determine the correct hardness, too. But be aware: Hardness is neither a physical nor a generic material property! 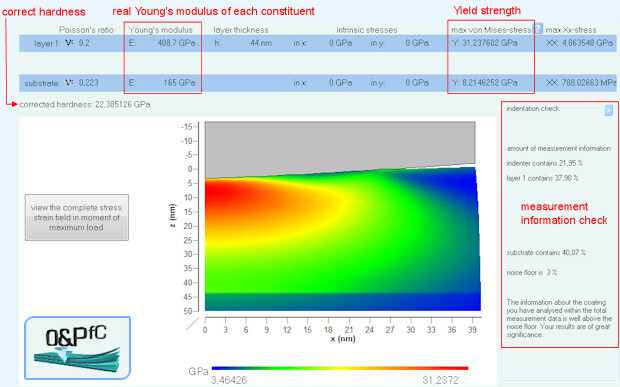 Result page of O&PfC®, showing real Young's moduli, yield strength, corrected hardness, and measurement information share of each constituent. video: "Evaluation of a coating's Young's modulus by normal indentation of a FischerScope®"
Further manufacturers are still developing and will follow soon.